Usually, when we’ve overslept and we’re in a rush and struggling to get dressed, the outfits we throw together are better described as "hungover college senior" than "put-together lady." But looking chic and polished at all times doesn’t have to take a ton of effort. Don’t believe us? Just take a gander at the following 20 ladies, whose outfits are as straightforward as they are gorgeous. Half-tuck the sweater to keep a chunkier knit from looking sloppy. Two things to note here: First, this combination is supremely (and almost universally) flattering, thanks to the clavicle-showing top and waist-cinching skirt. Second, an all-black-and-white look is another easy color trick for looking elegant. Psst…this borrowed-from-the-boys look would be just as stylish with a pair of crisp white sneakers. Hot tip: Stick to darker-wash jeans. They look more polished and are easier to dress up than lighter washes. Tuck the shirt all the way in and take off the choker to make this outfit office-appropriate. Then, tousle things up at 5 p.m. for a great day-to-drinks look. Think of this as the spring/summer version of the last look and wear it with abandon. You Don’t Have to Be Covered Up to Look Put-Together: A Memoir, by this chic lady. An all-black ensemble is the easiest way to look like an off-duty model (even if the closest thing you’ve come to being a model is posing for an Instagram snap). Counter a loose-fitting jacket and pants with feminine heels and a fitted top. Who says you have to wear heels to look stylish and refined? Grace Atwood’s casual-chic look is begging to be worn to your next brunch. We adore this embellished trench, but this outfit template would work with pretty much any light jacket. Unbelted, a slip dress can look a little bedroom. But cinched at the waist and topped with a skinny scarf tied around your neck, it’s a far cry from lingerie. You could mimic these silhouettes in more muted colors, but an unexpected red and pink combo is fun while still being sophisticated. Dressing up jeans 101: Pair them with a fancier top (we’re currently loving the one-shoulder thing) and low heels. The top half of this combination is a no-brainer, and the flash of bold boots peeking out from a cropped hem takes it to the next level. How to keep a crop top classy? Make like Monroe Steele and pair it with a high-waist skirt that shows off just a hint of skin at your midriff. Introducing your new weekend uniform. 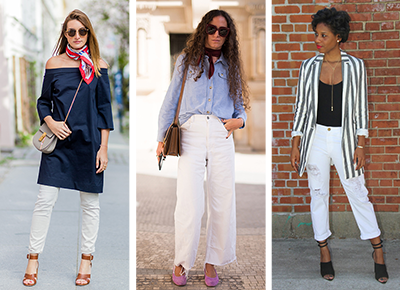 FYI, when you’re pairing a white tee with white jeans, the shades don’t have to match perfectly.